There’s an excellent Microsoft article on TechNet that explains how to configure client-specific message size limits, in Exchange 2013. There are a lot of good reasons to raise your client limits, as there are also a lot of reasons not to. As long as you’re aware of what your on premises Exchange Server can handle, and you’re not exposing the server to overload or degradation of the service, by raising those limits, than from my perspective, you’re fine doing it. UPDATE: Michael de Rooij just brought to my attention an excellent script he has, that automates everything described on this post. You can read his article here and download the script here. If for some reason you still want to change it manually, continue reading the steps described below. On this blog post we are going to change the Exchange Web Services limits. The reason behind it is simple: MigrationWiz leverages the Exchange Web Services to move data to and from your Exchange based systems (on premises or in the cloud), and the default limits on an Exchange 2013 will make the migration of every item over ~35MB fail. The solution to have those items migrated is to increase the EWS limits on your target Exchange Server. Now let me show you what to do that. In my case I will raise the limit to 200MB. Go here to convert the 200MB in bytes. Above you can see the path on the Client Access Server. Search for the value to change on the CAS server, and edit it to match the 200MB. 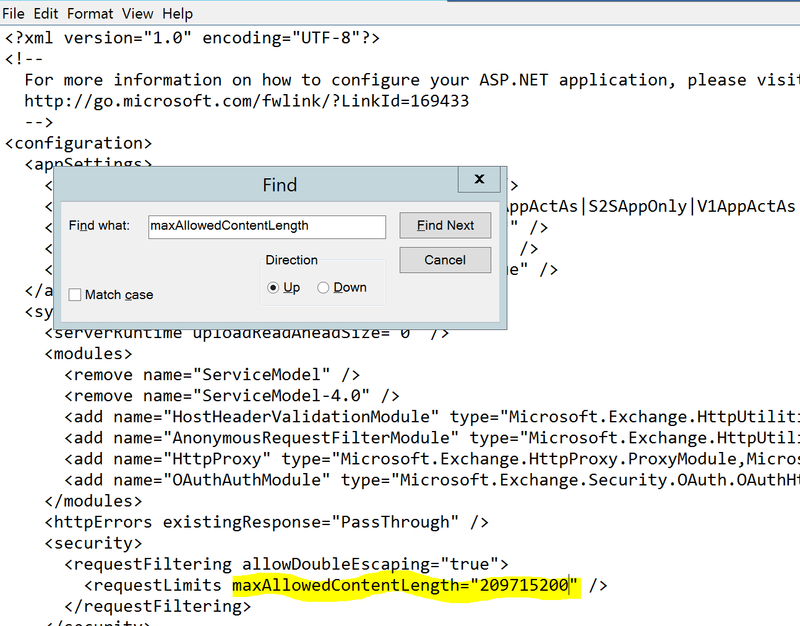 Go to the Mailbox server web.config file location (also used on the maxAllowedContentLenght change). Search and replace the 14 instances. Once the changes are made, save the web.config file and do an IISReset from the command prompt. Note: In the web.config file on Mailbox servers, there are also two instances of the value maxReceivedMessageSize=”1048576″ forUMLegacyMessageEncoderSoap11Element bindings that you don’t need to modify. 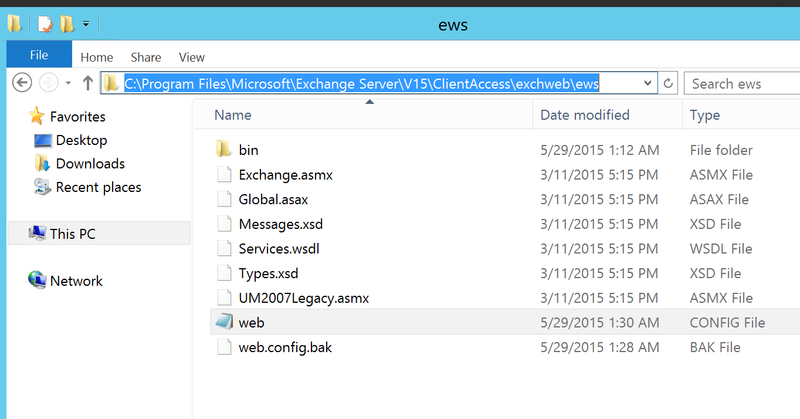 Now your on premises Exchange Server will be able to handle much larger files via EWS.